Easily Install Net Protector Security on all client PCs across the network from the Console. Install silently on Servers, Desktops and Laptops without interrupting the user. View the Network security health status. Statistics of the Clients, Update and infection status across the network. Informative charts and graphs. View Protected and Unprotected Client PCs in the network. View infected PCs and take appropriate actions. Manage the client PCs in groups. Manage client settings and enforce security policies. Manage all automatic schedules. Start the scanning on selected clients. View scan progress, Live Threats in Memory, Disk Virus Count. Scan Memory and Scan PC Commands. Silent scan without disturbing the user. Transfer and run applications and patches on remote PCs. View and Manage running processes. Launch special cleaners and security modules. Perform LAN Updates from the console. View update status chart and graphs. Take action for Out-Of-Date client PCs. Update client PCs without Internet. Reduces your Internet traffic and bills. Block access to all removable media. Protect your Business confidential data. Detailed reporting of the threats on client PCs. Top 5 Threats spreading in the Network. Registered users will receive free product updates and upgrades from internet for the subscription period. Registered users can avail free support through phone, email and internet for the subscription period. Best tool for System and Network Administrators. Easy Installation and maintenance. 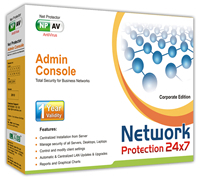 Admin Console can be installed on any one PC of the network. Preferably with Windows Server Operating system.